Live a day like a Cuban: discover Little Havana and learn about the local culture and history on this half-day tour. Taste authentic Cuban foods, like Guava-pastries and stewed meat (included in price) from family-owned restaurants and learn about the history and influence of Cuban culture in Miami from your guide. This tour will also take you past important Cuban landmarks such as the Bay of Pigs Museum and Cuban Memorial Park. This is a small-group tour with a maximum of 10 travelers per booking. Meet your local guide at a central location in Little Havana and begin your adventure through the Cuban-American cultural and historical capital. Block by block, in a small group, you will discover the Cuban history of Miami and gain knowledge from your guide of the relations between the United States and Cuba. You will visit six local, family-owned Cuban and South-American restaurants and sample various cuisines offering a fusion of local and international decadence. Tastings will include Cuban coffee and mojitos, ropa vieja (stewed beef), guava-flavored pastries, Cuban sandwiches, and more. 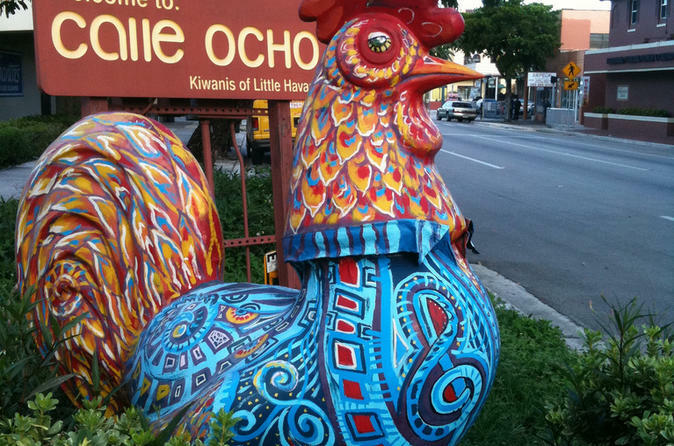 On Calle Ocho, in Little Havana, skilled local workers will show you how to make famous Cuban coffee and cigars, and then you will explore the rising Cuban art scene and local artist galleries. You will also witness historical landmarks such as Maximo Gomez Domino Park, Cuban Memorial Park, Bay of Pigs Museum, Tower Theater, and more.